The consequences of globalization and mass migration are such that, it has been estimated, over 200 million people are living in countries other than where they were born. And as formerly homogeneous societies evolve into multicultural entities with traditional social and geographic boundaries giving way to increasingly complex representations of identity, new—and urgent—questions for psychologists, social scientists, and policymakers arise. As research in and around cross-cultural psychology burgeons as never before, this new four-volume collection from Routledge meets the need for an authoritative reference work to make sense of a rapidly growing and ever more complex corpus of literature. Edited by two leading scholars, the collection is organized into four principal sections: Basic Issues; Theory and Method; Substantive Findings in Basic Processes; and Substantive Findings in Applied Issues. Cross-Cultural Psychology provides a one-stop ‘mini library’ of foundational and canonical work. The collection also includes cutting-edge analyses and discussions of theory and research, alongside major works addressing policy implications. 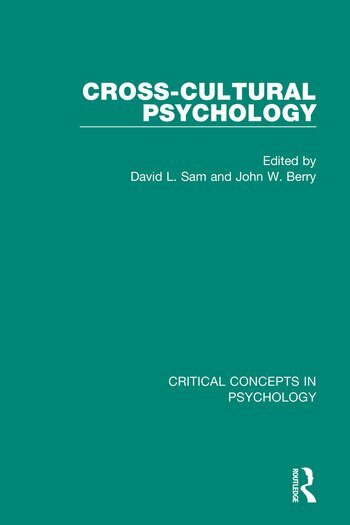 J. W. Berry, Y. H. Poortinga, S. M. Breugelmans, A. Chasiotis and D. L. Sam, ‘Introduction’, Cross-cultural Psychology: Research and Applications, 3rd Edition. (Cambridge: Cambridge University Press, 2011), pp. 3-20. G. Jahoda, ‘On Relations between Ethnology and Psychology in Historical Context’, History of the Human Sciences, 27, 4, 2014, 3 – 21. Y. H. Poortinga, ‘Research on Culture in Psychology: Taking Stock and Looking Forward’, Acta de Investigación Psicológia 3, 2, 2013, 1136-1148. L. H. Eckensberger, ‘Cross-cultural Differences as Meaning Systems’, in A. Chasiotis, F. J. R. van de Vijver and S. M. Breugelmans (eds), Fundamental Questions of Cross-Cultural Psychology (Cambridge: Cambridge University Press, 2011), pp. 407-441. C. M. Allwood and J. W. Berry, ‘Origins and Development of Indigenous Psychologies: An International Analysis’, International Journal of Psychology 41, 4, 2006, 243–268. R. Diaz-Loving, ‘Emergence and Contributions of a Latin American Indigenous Social Psychology’, International Journal of Psychology 40, 4, 2005, 213 – 227. J. W. Berry, ‘Cross-cultural Psychology: A Symbiosis of Cultural and Comparative Approaches’, Asian Journal of Social Psychology 3, 2000, 197–205. P. M. Greenfield, ‘Three Approaches to the Psychology of Culture: Where Do They Come From? Where Can They Go?’, Asian Journal of Social Psychology 3, 2000, 223 – 240. K.S. Yang, ‘Monocultural and Cross-cultural Indigenous Approaches: The Royal Road to the Development of a Balanced Global Psychology’, Asian Journal of Social Psychology 3, 2000, 241–264. M. H. Segall, ‘More Than We Need to Know About Culture, But Are Afraid Not to Ask’, Journal of Cross-Cultural Psychology 15, 1984, 153-162. J. W. Berry and H. C. Triandis, ‘Culture’, in K. Pawlik and G. d'Ydewalle (eds), Psychological Concepts (Hove: Psychology Press, 2006), pp. 47-62. W. J. Lonner, ‘The Continuing Challenge of Discovering Psychological "Order" Across Cultures’, in F. J. R. Van de Vijver, A. Chasiotis and S. M. Breugelmans (eds), Fundamental Questions in Cross-cultural Psychology (Cambridge: Cambridge University Press, 2011), pp. 64-94. A. Norenzayan and S. Heine, ‘Psychological Universals: What Are They and How Can We Know?’, Psychological Bulletin 131, 5, 2005, 763-784. R. L. Munroe and R. H. Munroe, ‘A Comparative Anthropological Perspective’, in J. W. Berry, Y. H. Poortinga and J. Pandey (eds), Handbook of Cross-cultural Psychology, Vol. 1: Theory and Method (Boston: Allyn and Bacon, 1997), pp. 171-213. D. F. Aberle, A. K. Cohen, A. Davis, M. Levy and F. X. Sutton, ‘The Functional Prerequisites of Society’, Ethics 60, 1950, 100-111. Y. H. Poortinga and K. Soudijn, ‘Behavior-culture Relationships and Ontogenetic Development’, in H. Keller, Y. H. Poortinga and A. Schoelmerich (eds), Between Biology, Culture and Development: Integrating Diverse Perspectives (Cambridge: Cambridge University Press, 2002), pp. 320-340. J. W. Berry, ‘Imposed Etics-Emics-Derived Etics: The Operationalization of a Compelling Idea’, International Journal of Psychology 24, 1989, 721-735. Y. H. Poortinga, ‘Equivalence of Cross-cultural Data: An Overview of Basic Issues’, International Journal of Psychology 24, 1989, 737-756. F. Van de Vijver and N. K. Tanzer, ‘Bias and Equivalence in Cross-cultural Assessment: An Overview’, European Review of Applied Psychology 54, 2004, 119-135. H. Barry, III, I. L. Child and M. K. Bacon, ‘Relation of Child Training to Subsistence Economy’, American Anthropologist 61, 1959, 51-63. H. Keller and P. M. Greenfield, ‘History and Future of Development in Cross-cultural Psychology’, Journal of Cross-Cultural Psychology 31, 2000, 52-62. P. R. Dasen, ‘Theoretical Frameworks in Cross-cultural Developmental Psychology: An Attempt at Integration’, in T. S. Saraswathi (ed. ), Cross-cultural Perspectives in Human Development: Theory, Research & Applications (New Delhi: Sage India, 2003), pp. 128-165. R. L. Munroe and M. Gauvain, ‘The Cross-cultural Study of Children’s Learning and Socialization: A Short History’, in D. F. Lancy, J. Bock and S. Gaskins (Eds. ), The Anthropology of Learning in Childhood (Lanham, MD: Alta-Mira, 2009), pp. 35-63. T. S. Saraswathi and H. Ganapathy, ‘Indian Parents' Ethnotheories as Reflections of Hindu Scheme of Child and Human Development’, in H. Keller, Y. H. Poortinga and A. Schoelmerich (eds), Between Biology and Culture: Perspectives on Ontogenetic Development (Cambridge: Cambridge University Press, 2002), pp. 79-88. R. F. Zimba, ‘Indigenous Conceptions of Childhood Development and Social Realities in Southern Africa’, in H. Keller, Y. H. Poortinga and A. Schoelmerich (eds), Between Biology and Culture: Perspectives on Ontogenetic Development (Cambridge: Cambridge University Press, 2002), pp. 89-115. A. B. Nsamenang and J. L. Lo-Oh, ‘Afrique Noir’, in M. H. Bornstein (ed. ), Handbook of Cultural Developmental Science (New York: Taylor & Francis, 2010), pp. 383-407. C. Kagitcibasi, ‘Autonomy and Relatedness in Cultural Context: Implications for Self and Family’, Journal of Cross-Cultural Psychology 36, 4, 2005, 403-422. J. Georgas, ‘Differences and Universals in Families Across Cultures’, in F. J-. Van de Vijver, A. Chasiotis and S. H. Breugelmans (eds), Fundamental Questions in Cross-cultural Psychology (Cambridge: Cambridge University Press, 2011), pp. 341-375. H. C. Triandis and M. J. Gelfand, ‘A Theory of Individualism and Collectivism’, in V. Van Lange, A. Kruglanski and E. T. Higgins (eds. ), Theories in Social Psychology (New York: Sage, 2012), pp. 498-520. S. H. Schwartz, ‘National Culture as Value Orientations: Consequences of Value Differences and Cultural Distance’, in V. A. Ginsburg and D. Throsby (eds. ), Handbook of the Economics of Art and Culture, Volume 2 (New York: Psychology Press, 2014), pp. 547-586. M. H. Bond, et al., ‘Culture-level Dimensions of Social Axioms and their Correlates Across 41 Cultures’, Journal of Cross-Cultural Psychology 35, 2004, 548-570. D. L. Best, ‘Gender’, in M. H. Bornstein (ed. ), Handbook of Cultural Developmental Science (New York: Taylor & Francis, 2010), pp. 209-222. D. P. Schmitt, J. Allik, R. R. McCrae and V. Benet-Martinez, ‘The Geographic Distribution of Big Five Personality Traits: Patterns and Profiles of Human Self-description Across 56 Nations’, Journal of Cross-cultural Psychology 38, 2007, 173–212. S. J. Heine and E. E. Buchtel, ‘Personality: The Universal and the Culturally Specific’, Annual Review of Psychology 60, 2009, 369–394. R. C. Mishra and P. R. Dasen, ‘Culture and Cognitive Development: The Development of Geocentric Language and Cognition’, in B. R. Kar (ed. ), Cognition and Brain Development (Washington, DC: APA, 2013), pp. 211-230. W. Hudson, ‘The Study of the Problem of Pictorial Perception Among Unacculturated Groups’, International Journal of Psychology 2, 1967, 89-107. A. Norenzayan, I. Choi and K. Peng, ‘Perception and Cognition’, in S. Kitayama and D. Cohen, (eds), Handbook of Cultural Psychology (New York: Guilford Press, 2007), pp. 569-594. H. R. Markus and S. Kitayama, ‘Culture and the Self: Implications for Cognition, Emotion and Motivation’, Psychological Review 98, 1991, 224-253. P. Ekman, et al., ‘Universals and Cultural Differences in the Judgments of Facial Expressions of Emotion’, Journal of Personality and Social Psychology 53, 1987, 712-717. D. Matsumoto, et al., ‘Mapping Expressive Differences Around the World: The Relationship between Emotional Display Rules and Individualism Versus Collectivism’, Journal of Cross-Cultural Psychology 39, 2008, 55-74. D. A. Van Hemert, Y. H. Poortinga and F. J. R. Van de Vijver, ‘Emotion and Culture: A Meta-analysis. Cognition and Emotion 21, 5, 2007, 913-941. E. Hunt and F. Agnoli, ‘The Whorfian Hypothesis: A Cognitive Psychology Perspective’, Psychological Review 98, 1991, 377-389. R. C. Mishra, P. R. Dasen and S. Niraula, ‘Ecology, Language, and Performance on Spatial Cognitive Tasks’, International Journal of Psychology 38, 2003, 366-383. Y. Kashima, E. Kashima and E. Kidd, ‘Language and Culture’, in T. Holtgraves (ed. ), The Oxford Handbook of Language and Social Psychology (New York: Oxford University Press, 2014), pp. 46-60. J. W. Berry, ‘Acculturation as Varieties of Adaptation’, in A. Padilla (ed. ), Acculturation: Theory, Models and Some New Findings (Boulder: Westview, 1980), pp. 9-25. R. Y. Bourhis, L. C. Moïese, S. Perrault and S. Seneìcal, ‘Towards an Interactive Acculturation Model: A Social Psychological Approach’, International Journal of Psychology 32, 1997, 369-386. S. Safdar, K. Choung and J. R. Lewis, ‘A Review of the MIDA Model and Other Contemporary Acculturation Models’, in E. Tartakovsky (ed. ), Immigration: Policies, Challenges and Impact (Hauppauge, NY: Nova Science Publisher, 2013), pp. 213-230. J. W. Berry, J. S. Phinney, D. L. Sam and P. Vedder, ‘Immigrant Youth: Acculturation, Identity and Adaptation’, Applied Psychology: An International Review 55, 2006, 303 – 332. F. Motti-Stefanidi, J. W. Berry, X. Chryssochoou, D. L. Sam and J. Phinney, ‘Positive Immigrant Youth Adaptation in Context: Developmental, Acculturation and Social Psychological Perspectives’, in A. S. Masten, K. Liebkind and D. Hernandez (eds), Realizing the Potential of Immigrant Youth (Cambridge, UK: Cambridge University Press, 2012), pp. 117-158. D. L. Sam and J. W. Berry, ‘Acculturation: When Individuals and Groups of Different Cultural Backgrounds Meet’, Perspectives on Psychological Science 5, 2010, 472 – 481. C. Ward and N.Geeraert, ‘Advancing Acculturation Theory and Research: The Acculturation Process in its Ecological Context’, Current Opinions in Psychology 8, 2016, 98 – 104. A.-M. T. D. Nguyen and V. Benet-Martinez, ‘Biculturalism and Adjustment: A Meta-analysis’, Journal of Cross-Cultural Psychology 44, 1, 2013, 122-159. K. Liebkind, ‘Intergroup Relations and Culture’, in C. D.　Spielberger (ed. ), Encyclopedia of Applied Psychology (Oxford: Elsevier Academic Press, 2004), pp. 335-348. J. W. Berry and D. L. Sam, ‘Multicultural Societies’, V. Martinez-Benet and Y. Hong, (eds), Oxford Handbook of Multicultural Identity (Oxford: Oxford University Press, 2014), pp. 97-117. T. F. Pettigrew, L. R. Tropp, U. Wagner and O. Christ, ‘Recent Advances in Intergroup Contact Theory’, International Journal of Intercultural Relation, 35, 2011, 271–280. S. Ting-Toomey, ‘The Matrix of Face: An Updated Face-negotiation Theory’, in W. B. Gudykunst (ed. ), Theorizing About Intercultural Communication (Thousand Oaks, CA: Sage, 2005), pp. 71-92. D. J. Kealey, D. R. Protheroe, D. MacDonald and T. Vulpe, ‘Re-examining the Role of Training in Contributing to International Project Success: A Literature Review and a New Model Training Program’, International Journal of Intercultural Relations 29, 2005, 289–316. S. T. Mol, M. Ph. Born, M. E. Willemsen and H. T. Van Der Molen, ‘Predicting Expatriate Job Performance for Selection Purposes: A Quantitative Review’, Journal of Cross-Cultural Psychology 36, 2005, 590-620. M. J. Gelfand, M. Erez and Z. Aycan, ‘Cross-cultural Organizational Behavior’, Annual Review of Psychology 58, 2007, 479-514. Z. Aycan, et al., ‘Impact of Culture on Human Resource Management Practices: A Ten-country Comparison’, Applied Psychology: An International Review, 49, 2000, 192-221. X. Huang and E. Van de Vliert, ‘Job Level and National Culture as Joint Roots of Job Satisfaction’, Applied Psychology: An International Review 53, 2004, 329-348. J. I. Galán and M. J. Sánchez-Bueno, ‘Strategy and Structure in Context: Universalism Versus Institutional Effects’, Organization Studies, 30, 2009, 609-627. R. M. Steers, L. Nardon and C. Sanchez-Runde, ‘Culture and Organizational Design: Strategy, Structure, and Decision-making’, in R. S. Bhagat and R. M. Steers (eds), Cambridge Handbook of Culture, Organizations, and Work4 (Cambridge: Cambridge University Press, 2009), pp. 71-117. J. W. Berry and D. L. Sam, ‘Cultural and Ethnic Factors in Health’, in S Ayers, A. Baum, C. McManus, S. Newman., K. Wallston., J. Weinman and R. West (Ed.) Cambridge Handbook of Psychology, Health and Medicine (Cambridge: Cambridge University Press, 2007), pp. 64-70. J. W. Berry, Y. H. Poortinga, S. M. Breugelmans, A. Chasiotis and D. L. Sam, ‘Health’, in Cross-cultural Psychology: Research and Application, 3rd edition (Cambridge: Cambridge University Press), pp. 405-440. A. J. Marsella and A. M. Yamada, ‘Culture and Mental Health: An Introduction and Overview of Foundations, Concepts and Issues’, in I. Cuéllar and F. A. Paniagua, (eds), Handbook of Multicultural Mental Health (San Diego, CA, US: Academic Press, 2000), pp. 3-24. M. Cole, ‘Internationalism in Psychology: We Need it Now More Than Ever’, American Psychologist 61, 2006, 904-917. P. J. D. Drenth, ‘Ethics and Social Responsibility’, in C. Spielberger (ed. ), Encyclopedia of Applied Psychology (Amsterdam: Elsevier, 2004), pp. 841-844. S. Zebian, R. Alamuddin, M. Maalouf and Y. Chatila, ‘Developing an Appropriate Psychology Through Culturally Sensitive Research Practice in the Arabic-speaking World: A Content Analysis of Psychological Research Published between 1950 and 2004’, Journal of Cross-Cultural Psychology 38, 2007, 91- 122. R. C. Tripathi, ‘Culture as a Factor in Community Interventions’, in J. W. Berry, R.C. Mishra and R.C. Tripathi (eds), Psychology in Human and Social Development (New Delhi: Sage, 2003), pp. 235-259.